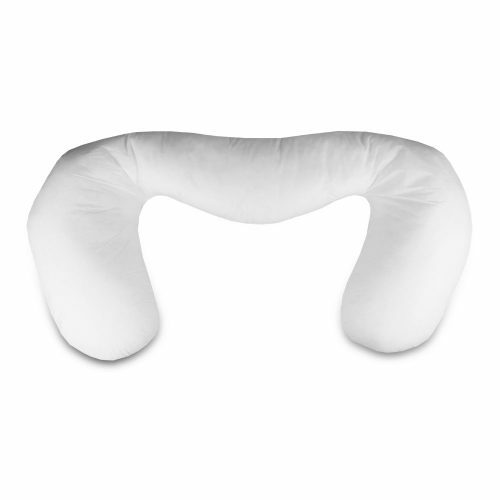 Our polyester fibre filled Original Pregnancy Pillow is designed to give pregnant women a comfortable position in which to relax. Its shape provides a soft head section, a protruding mid section to support your bump and is extended for you to wrap your legs around. The whole pillow has been designed to be hugged and snuggled up to giving a feeling of warmth and security. The pillow can be used after baby is born too. There are ties at each end of the pillow which enable you to wrap the pillow around your waist, tying the ends together providing a soft platform on which baby can be fed. 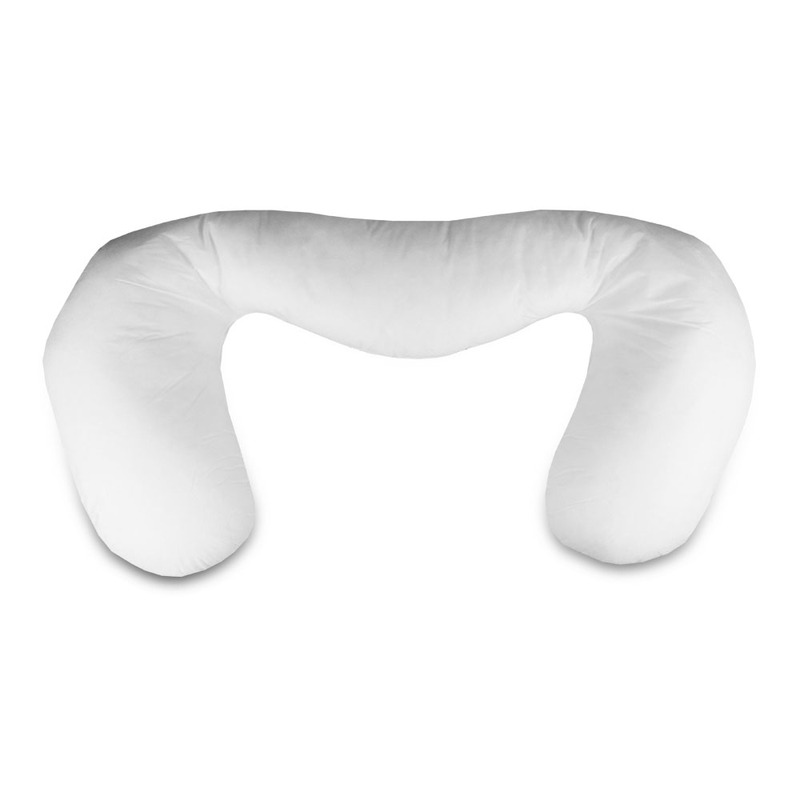 The pillow comes with a zipped, removable, machine washable cotton cover. The cotton cover & pillow can be machine washed at 30°. The cover & pillow can be tumble dried on a low heat setting, although natural drying methods are advised. All our covers include directions for caring for the products. Here at Carousel Care we are passionate about the products & services that we provide. We are also proud of our heritage. For the products that we do not manufacture ourselves, we do insists that they are all designed, manufactured and distributed from UK based businesses. The vast amount of our products are made within our local vicinity, we do our very best to support our local community. We also care about the environment and we ensure that any waste materials are recycled appropriately by all set guidelines. We have carefully selected a number of courier firms, in which we place our trust in to deliver your order quickly & efficiently. We guarantee that if you live in the UK Mainland, then we won’t charge you a fee for delivering your items. If you live in an area deemed as being non UK Mainland as set by our couriers, then we may have to charge a fee for delivery. Any fees will be visible at the checkout. The Delivery Zones are visible as a link at the top of every page, so please do check your area and contact us if you have any questions. We take an enormous amount of pride in the quality of our products, and offer a 12 month manufacturer warranty for that extra little peace of mind. Our manufacturer warranty covers any manufacturing defects that may occur. Please contact us on 0161 660 5960 if you wish to discuss anything concerning a faulty product so we can advise accordingly. Please see the T&C’s section for specifics. We fully understand & appreciate that you may order a product and decide it’s not quite what you need. We offer a 28 day return for a full refund on all our products. If for any reason you are not entirely satisfied with your purchase, please return it unused, in it’s original packaging. We will issue a full refund as soon as we receive the item. Please feel free to contact us on 0161 660 5960 if you have any queries. The safety of your personal data is as important to us as the safety of our products. Carousel Care is protected by 256 BIT SSL Encryption, so rest assured that your information is as safe as possible. Payment can be made by PayPal, or by any major Credit / Debit Card through our Payment Gateway, which also offer 256 BIT SSL Encryption. We do not share or sell any personal data, and we do not insist that you register on on website before or after you make a purchase. Carousel Care, Unit 7, Castle Industrial Estate, Beresford Street, Failsworth, Manchester, M35 0HD.